Mercedes-Benz - brand of premium class passenger cars, trucks, buses and other vehicles «Daimler AG» German auto-concern. It is one of the most recognizable automotive brands in the world. The headquarters of Mercedes-Benz in Stuttgart, Baden-Württemberg, Germany. In 2014, the brand was estimated at 34.338 billion dollars, holding the second place (after Toyota) among manufacturers of automobiles and the tenth place among all brands in the world. According to BrandZ brand in 2015 takes place from 43 valued at 21.786 billion dollars. 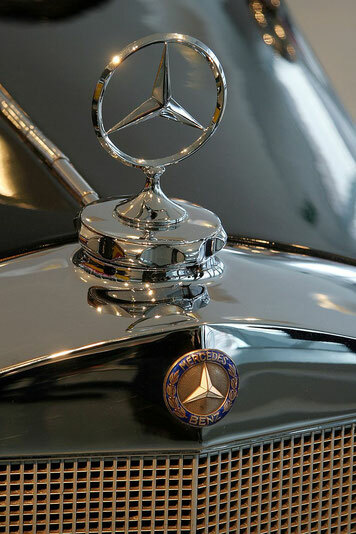 The history of this brand is made up of the stories of two famous car brands - "Mercedes", produced by the German company "Daimler-Motoren-Gesellschaft", and "Benz", which were built by the same name. Both companies are quite well developed independently, a in 1926 merged into the new "Daimler-Benz". In 1886, it created three-wheeled self-propelled carriage with a petrol engine. In the same year on January 29 its creator - Karl Benz - received a patent for this invention (number 37435). The world's first three-wheeled car is put into production. Seven years later, losing the championship Daimler, Carl Benz creates a four-wheel vehicle, and the following year an even more perfect design under the strange name "Bicycle" goes to series. In 1901, shortly after the release of the new Daimler model "Mercedes-35PS», it becomes clear how "Benz" behind the progress. To catch up, shareholders are invited to the company of the French engineer Marius Barbara. Due to technical differences Karl Benz left the company he founded same. It soon becomes clear that the Frenchman did not live up to expectations. Following the logic of that German cars should be made by the German arms company in the post of chief engineer invited Fritz Erle. This idea is also unsuccessful. Only with the arrival in the company of the talented engineers Hans Niebel things gradually start to go uphill. In 1909, having created a number of beautiful cars, the company has built the most famous racing car at the time, "Blitzen Benz" with engine capacity of 200 horsepower and a volume of 21,594 cm3. In the postwar years created a lot of new models, most of which has successfully produced up to mid-twenties. In total since the start of production in 1886 and prior to the merger with the "Daimler-Motoren-Gesellschaft" in 1926, the company "Benz" produced 47.555 vehicles, including cars, trucks, omnibuses. In 1890, Gottlieb Daimler in the Bad Kanshtat (Stuttgart) founded the company "Daimler-Motoren-Gesellschaft", decided to release four years earlier created by him and who took an active part, Wilhelm Maybach, four-wheel vehicle. After a series of not very successful attempts that are still found their enthusiastic buyers, designer V. Maybach in 1901 managed to create a successful design. At the insistence of the Consul of the Austro-Hungarian Empire in Nice and concurrently head of the mission "Daimler" in France, Emil Jellinek car is named in honor of Our Lady of Mercy (Fr. Maria de las Mercedes (from the Latin «merces» -. «Gifts»)), in honor of which are also called all his children, including the notorious daughter of consul Mercedes and property (boats, houses, a hotel and casino). The first "Mercedes-35PS» had a four-cylinder working volume of 5913 cm3, a classic arrangement of main units and beautiful (at the time) appearance. A year later I saw the light of improved design under the name "Mercedes-Simplex". In addition, the expanded range. The best-known representatives of this series bore the proud name "Mercedes 40 / 45PS» and «Mercedes-65PS», having engine capacity to 6785 cm3, respectively, 9235 cm3, allows a speed up to 90 km / h.
Before the First World War, "Daimler-Motoren-Gesellschaft» managed to produce a wide range of its cars with different engines (from 1568 cm3 to 9575 cm3), designed for a variety of consumers, including luxury, virtually noiseless cars using engines valveless gas distribution, produced by patent uS company "Knight." Immediately after the war, Paul Daimler starts to conduct experiments with the compressor, allowing a half times increase the engine power. The newcomer to the position of Chief Engineer in 1923, Ferdinand Porsche brought the experiment to its logical conclusion by creating in 1924 one of the greatest cars in the world - "Mercedes 24/100 / 140PS» with magnificent chassis and six-cylinder supercharged engine volume of 6240 cm3 and power 100- 140 horsepower. By 1926, "Daimler-Motoren-Gesellschaft» he made in all of its factories for a total of 147.961 car, with maximum capacity was reached in 1918. Despite all the difficulties of the last war years, it was able to produce 24.690 cars. After the merger in 1926, Daimler and Benz firms new group Daimler-Benz was able to effectively use the expertise of designers of both companies, which lead became Ferdinand Porsche. It is completely updated production program, based on the latest models of Daimler, now being issued under the Mercedes-Benz brand. The first new development was the Porsche compressor series in 1926, which included model 24/100/140 (Eng.) Six-cylinder engine with a displacement of 6240 cm3. For more power and speed (up to 145 km / h), it was called "death trap". It has become a base for a famous series of S, consisting of models S (Sport), SS (Supersport), SSK (Supersport Kurz - supersport short) and SSKL (Supersport Kurz leicht - supersport short light). In 1928, Porsche left Daimler-Benz, and was replaced by Hans Niebel (German. Hans Nibel). Under his leadership, released cars Mannheim 370 (Eng.) Six-cylinder engine with a displacement of 3.7 liters. and Nürburg 500 (Eng.) with eight 4.9-liter unit, based on the latest developments of Porsche. In 1930 came the "Big Mercedes" (it. Großer Mercedes) or a Mercedes-Benz 770 (W07) with eight 200-horsepower engine, working volume to 7655 cm3 with a supercharger. 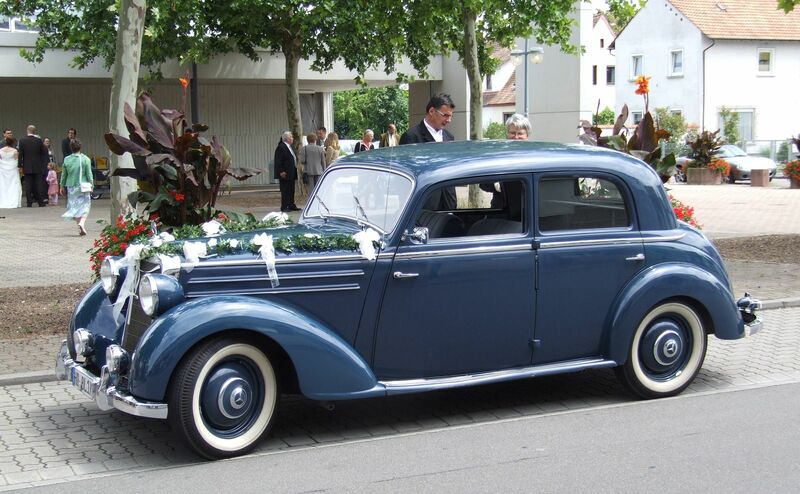 In 1931, the firm made its debut in the small car sector, where it represented the highly successful Mercedes 170 (Eng.) With a six-cylinder engine, working volume of 1692 cc and independent suspension front wheels. 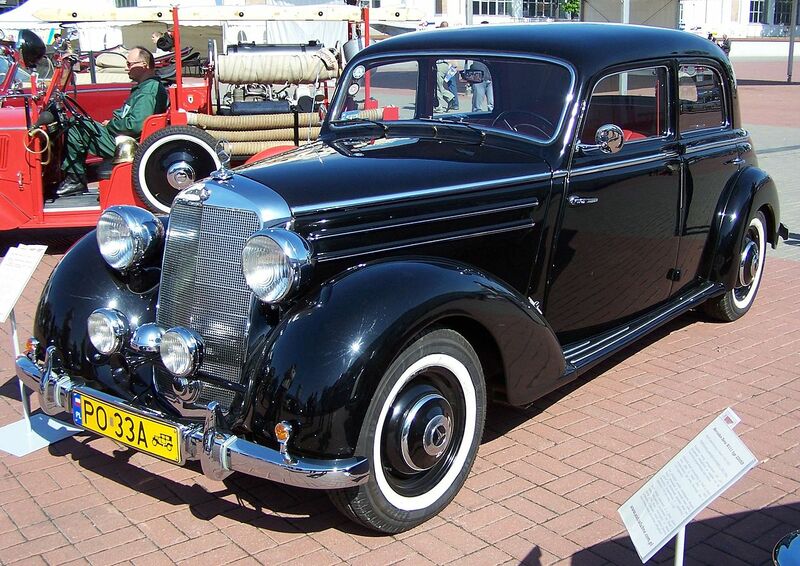 In 1933, there were passenger Mercedes-Benz 200 and sporty Mercedes-Benz 380 with 2.0-and 3.8-liter engines. The last of them was equipped with a supercharger, and had a capacity of 140 horsepower. Based on the sports model in 1934 created the Mercedes-Benz 500K with a 5-liter engine, which has become in two years the basis for the more famous large compressor car Mercedes-Benz 540K. In 1934-1936 years the company has released a lightweight Mercedes-Benz 130 with a four-cylinder 26-horsepower rear-location, total working volume of 1308 cm3, followed by 150 roadster and sedan 170H. Under the technical direction of chief designer Max Sailer (Eng. Max Sailer), who replaced Niebel in 1935, created the popular low-cost model 170V with four-cylinder engine working volume of 1697 cc, the world's first serial car with a diesel engine Mercedes-Benz 260 the D (1936 year), as well as the new "Big» Mercedes-Benz 770 (W150) (1938) with the frame beams of oval cross section, and the rear spring suspension, which served as the Nazi leaders. During the war, Daimler-Benz produced as trucks and cars of different classes. However, a two-week aerial bombardment of Anglo-American Air Force in September 1944 made Daimler-Benz Aktiengesellschaft into a heap of ruins. The destruction of a large group were evaluated in different ways, the main plant in Stuttgart was destroyed by 70%, motor and body shop in Zindelfingene - 85% of trucks in Gaggenau plant was completely destroyed. Former factory Benz und Cie in Mannheim were more fortunate of all - only 20% of destruction and plant diesel engines Berlin-Marienfeld, Daimler'om bought in 1902, completely razed to the ground. When the evaluation of destruction were ready by January 1945, the Board of Directors decided that the «Daimler-Benz physically no longer exists." In the post-war reconstruction of destroyed factories it took time, so the car production was started only in June 1946. 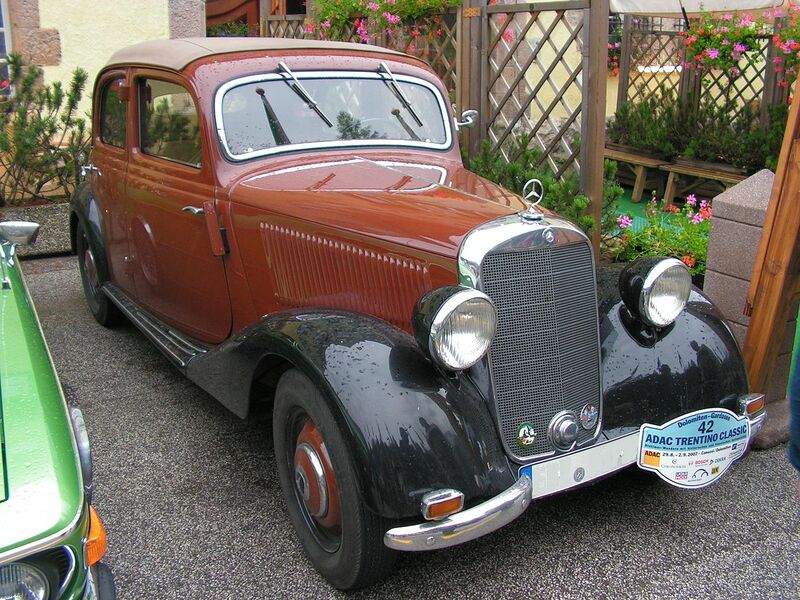 To develop the new car had no technical basis, nor the means, so the first post-war car was a sedan W136 - «170V». Although the design was developed in the mid-1930s, a compact car with an engine of 38 horsepower was the beginning of a new history of the brand. Already since May 1949, the major upgrade performed. The engine is increased by 70 cc (52 hp . ; model «170S». ), There were variations in bodies convertible and station wagon (the so-called convertibles «A» and «B»..), And most importantly - models with diesel engines "170d ". By the beginning of 1950 Daimler had big ambitions for the future, but the launch of a new generation of vehicles require further development of the production base. Therefore, in the early 1950s, despite the emergence of a new luxury series of "300" (see. Below), the continued production of models with obsolete design. Continued constant modernization and launch of new models. Thus, a model with a larger body, which was number W191 in January 1952 year. But even before this, in March 1951, on the car set a six-cylinder engine with a capacity of 80 liters. from. instead of 4-htsilindrovogo. Along with the new exterior design (eg, the location of the front lamps in the wings) car W187 received a new name, "220" and won the middle segment between "170" -th and "300" -th. It is offered in three body styles (sedan and convertible «A» and «B»). After successful recovery plants and the production of its small car, the end of the 1940 Mercedes-Benz once again began to restore its pre-war brand as a manufacturer of luxury cars. Given the current advances in automotive mode, the new W186 «300» Executive limousine appeared in November 1951, at the Paris Motor Show. The car, though, and was built in a classical arrangement (a separate frame and body), equipped with a powerful 6-cylinder engine in 2996 cc with overhead camshaft. The machine is available in two body styles - sedan and four-door convertible «D» and was a huge success among the big businessmen, celebrities and politicians. It is the latter category and gave the car the unofficial name in honor of the first Federal Chancellor of Germany, Konrad Adenauer, who had a private car and appreciated it. Since the assembly of the vehicle was carried out manually, the interiors were made by buyers and equipped with radio, telephone and many other innovations. 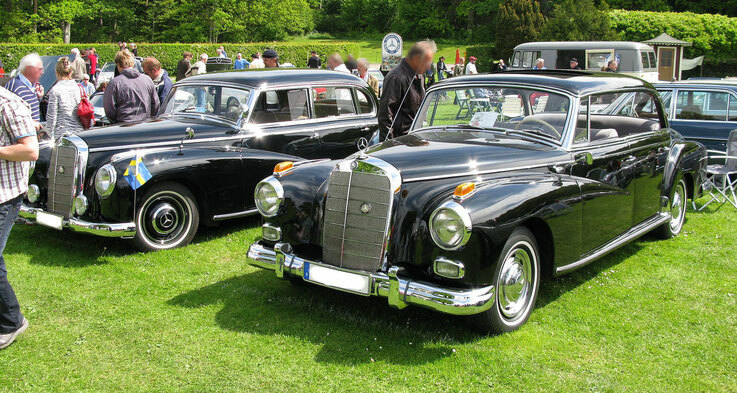 Flagship cars W186 (left) and his successor W189 (right) were collected manually c 1951 to 1961 minutes. Outdated design of the stamp has not prevented the return of its pre-war glory. Manual assembly of cars allowed to carry out the continuous modernization, the result at the end of 1954, there was a series of W186 «300b», which has received new brake drums and front windows. A year later it was replaced by "300c", equipped with automatic Borg-Warner transmission company. But the biggest step forward was made in the mid-1950s, when Bosch was made by the invention is a fuel injection system. She was equipped with a series of W188 «300Sc» c the end of 1955 year. 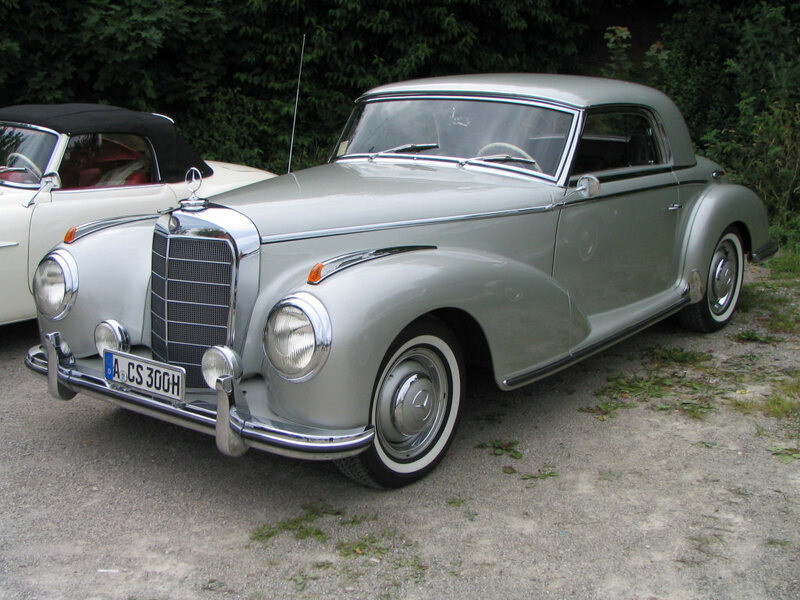 In January 1952, there was another series of representative class W188 - «300S», which was produced as a coupe, cabriolet "A" and a two-seater roadster. Engine compression ratio increased to 7.8: 1, and the power was 150 liters. from. If the assembly of large "Adenauer" was relatively fast (about a thousand a year, taking into account the total capacity of the plant of the brand), the average production of cars, "300S" was no more than a hundred pieces a year. 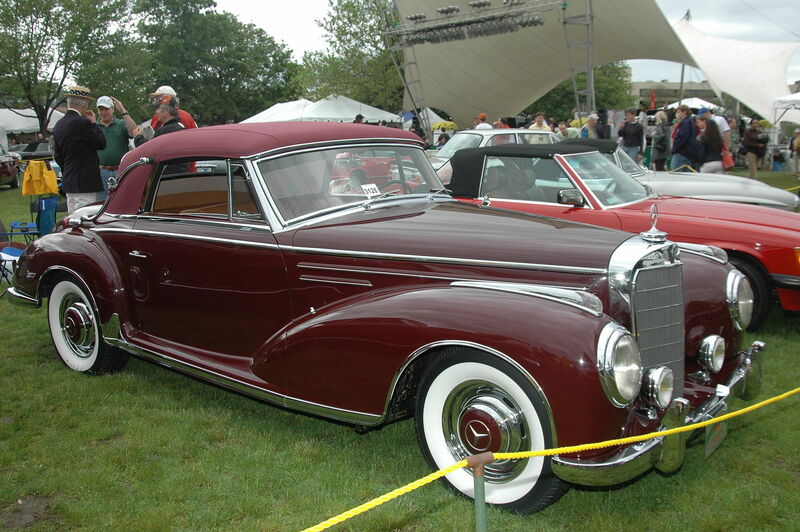 However, if at large, "Adenauer" demand continues, the limited-edition release of "300S" became impractical after the appearance of the SL and similar two-door models of pontoon in the middle of 1950 (see. Below). Further assembly of obsolete cars for the company was a great burden, so in 1958 the release of all three bodies W188 discontinued after the release of just 760 cars. As for the flagship sedans and convertibles «D», in August 1957, carried out a thorough modernization of the car, which became known as the W189 - «300d». The main external difference was in the rear of the body, which took the form of a pontoon sedan (see. Below). Similarly, it changed the shape of the roof and rear glass with a larger tail. Side glazing also got very comfortable for summer time possibility to remove the center column. In order to successfully enter the US market, cars can be equipped with air conditioning and power steering, and their tires painted white. Under the hood, the new "Adenauer" Now there was a fuel injection system and the engine can develop 180 hp. from. and disperse the heavy car to 165 km / h.
Assembling the "Adenauer" lasted until March 1962, the total built-W186 8288 x 3142 and W189. Because of this Mercedes-Benz series fully regained its pre-war reputation as the luxury car manufacturer. At the beginning of the 1950s. at the Mercedes-Benz finally appeared the resources and staff to realize their ambitions. As already mentioned, the model "170" and "200" to the beginning of the 1950s is completely outdated, and "300" -e could afford only the elite of the time. Marche required unified series of vehicles that would be modern, reliable, but it is relatively inexpensive and easy to maintain. The solution was obvious - monocoque body type, but then Mercedes-Benz has retained the classic lines of wheel arches, and thus introduced into the automotive design terminology pontoon body. 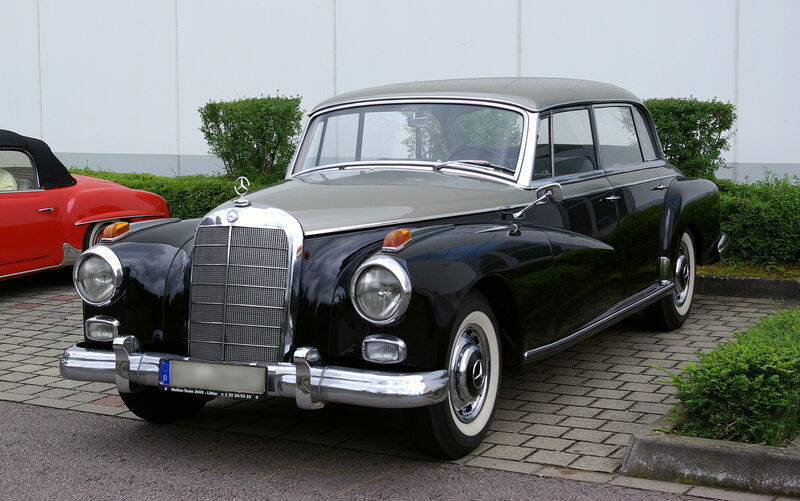 This was a new car W120 «180», first aired in July 1953, Issue lasted until the early 1960s. and it has developed many models and upgrades. Thus, in February 1954 there was a diesel option «180D», and in March 1956 a more powerful and comfortable W121 «190», which also appeared diesel version «190D» in August 1958, but the most significant model was the sporty roadster «190SL», built on a common body with the W121, in spite of the significant external differences (see. the description below). The first six-cylinder, ie. N. "Large pontoons" appeared in June 1954 with the W180 "220a" model with an engine capacity of 89 liters. from. Like his younger brother, cars suffered a series of modifications to March 1956 there was a similar "190" -th flagship series "220S", which was produced, in addition to the sedan, two-door body styles in coupe and convertible with an engine capacity of 105 liters. from. Old as "220a" are now referred to as "219" under the new number of the body W105. The final touch in the history of large pontoons took place in October 1958, when the model «220SE» of fuel injection system (E - Einspritzmotor) for sedans, coupes and convertibles, which are now referred to as W128. Release large pontoons 220 series lasted until September 1959 (sedans) and November 1960 (coupes and convertibles). Total built, respectively, 111,035 and 5371 such vehicles. 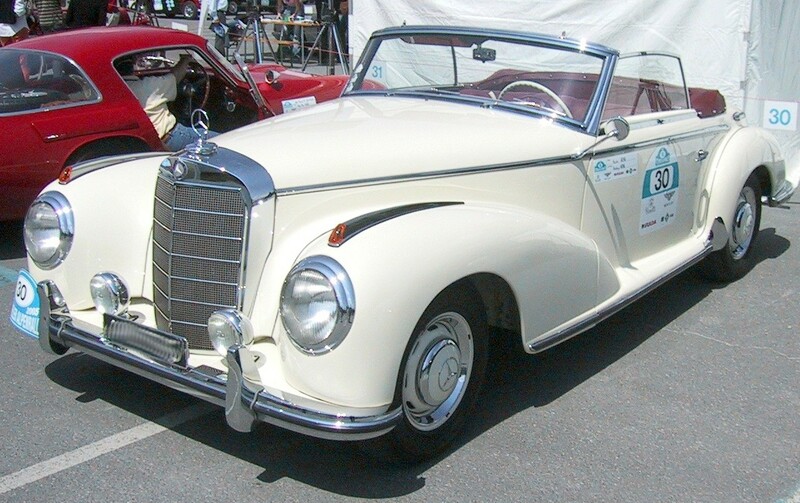 Younger pontoons produced longer, up to October 1962 were built 442,963 sedans W120 and W121, and 25881 roadsters «190SL». Total 585 250 cars, the scale of which has allowed the brand to celebrate the whole world as their only officially exported to 136 countries. During the time of release creates a solid base for the production of future models, already in 1960, to analyze Daimlera build a car in Sindelfingen took only 25 hours. But the automotive world in the late 1950s - early 1960s. He is undergoing rapid change, and in order to remain competitive in an unequal battle with the American manufacturers needed new generation of cars. Simultaneously with the production car company has paid much attention to restore the reputation of racing. The whole creation has been involved light aerodynamic body. A particular success was the car Mercedes-Benz W196, which the Argentine driver Juan Manuel Fangio won the Formula 1 championship in 1954 and 1955 (see. Mercedes team in Formula 1). The car itself is built on the experience of former designers of aircraft engines fighter Messerschmitt Bf.109 and had a fuel injection system and desmodromny actuator valves. In 1955, an improved version of the car - Mercedes-Benz W196S (300SLR) under the number 722, which sat behind the wheel of the famous British racing driver Stirling Moss, determined not beaten to this day, the record of the race Mille Miglia. Despite the tragic outcome of the race 24 Hours of Le Mans that killed Pierre Levegh and 82 viewer, Mercedes-Benz won the world championship in 1955. However, after this the brand has gone from the racing world for many years. But the success did not remain without consequences. Back in 1952 there was a racing model Mercedes-Benz W194, the predecessor of the SLR, which was able to finish in second and fourth places in the Mille Miglia of this year, and also participated in the race Carrera Panamericana and Targa Florio. The car body consisted of a tubular frame covered with sheets made from lightweight patented aluminum alloy and has a lightweight and redesigned version of the six-cylinder engine from the "Adenauer". The most interesting elements of the design have been a form of cabins and doors, which are to provide strength and reduce weight, opened up and gave the car the nickname "gull wing". In 1953, the businessman Max Hoffman (Max Hoffman) has offered the company to create a road version of the W194 for developing the American market. The result was the Mercedes-Benz W198 (300SL). Since its premiere in 1954, its futuristic features and, of course, unusual doors, ensure a complete success. US elite, which supplies more than 80% of all cars are bought them at auction. Initially, the car was the engine with a system of three types of carburetors Weber develops power of 115 hp. a., but it was soon established the Bosch fuel injection system, which increased the capacity to 215 liters. from. and allowed to disperse a light car to 250 km / h.
car 300SL success shocked the company itself. However, with all its pros complex design and build long made it inaccessible to the cost of the old world. Sensing the potential of the market opened for the brand, Mercedes-Benz engineers immediately began mass develop a model based on the standard "pontoon» Mercedes-Benz 190 (W121). The vehicle retains much of the 300SL - independent front suspension and rear suspension with swinging half-axles. In April 1954, the premiere of "little brother» 190SL. The car was produced as a roadster, or with a removable rigid roof or with a folding canvas. The price of it was almost two times less than the 300SL, the car proved to be very successful, especially among female consumers. In 1957 300SL undergone a major upgrade, during which he lost his unique design door-wings. Several reasons for this: firstly, the car was rather race than class Gran Turismo, in which he unexpectedly passed. Therefore, in terms of convenience it has major drawbacks, such as lack of trunk, poor ventilation (only through the rear quarter windows that could open slightly) and the entry and exit of passengers in the cabin, which was very inconvenient, especially for women. Another reason was the high mortality rate in accidents due to the fact that passengers are difficult to get out of the car, especially if it's a coup. 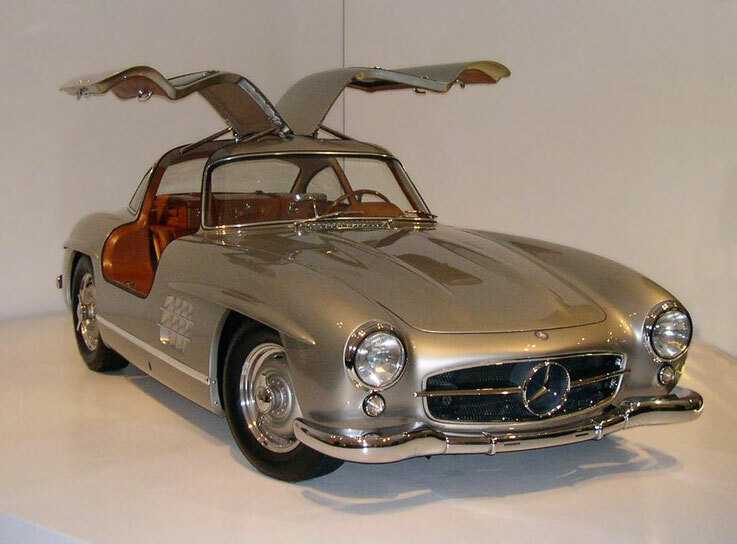 Therefore, the new 300SL appeared in 1957, which turned into a Roadster, 190SL and similarly produced with both canvas and with a removable rigid roof. This car has received a new, more comfortable rear suspension, disc brakes (1961) and, for the first time Mercedes-Benz, it set a new type of vertical adjustment, which will soon become a feature of all subsequent models of the brand until the early 1970s . In 1963, both cars finished release. Total production in 1400 300SL cars of the first generation and the second 1858. "Pontoons» 190SL built 25,881 units. Both cars of the brand opened a whole new class of machines that now have the end of the SL - Sport Leicht - sports and easy. In the 1950s, Western Europe emerged from the devastation and poverty - the consequences of the Second World War. Back in September 1956, when the pontoons are only just begun to be released, Daimler-Benz took over management of the development of a new generation of cars. The main requirements were higher than ever: the safety and convenience of passengers inside the car was outside must be in the form of Italian style car, the front part of the same inherited from Mercedes-Benz'a. Development began in 1957, during the period when the undisputed leader in the automotive industry was America. American external design of the car is undergoing a revolution, which has been called the era of jet aviation and space flight (hence the characteristic "wings" that adorned the back of the body). At the last moment the leading engineer-designer added this item in a new design. Although the wings themselves were much smaller and more modest than their American counterparts, they gave the characteristic form of the nickname entire generation «Heckflosse» Car - "fins". Production began in early 1959. 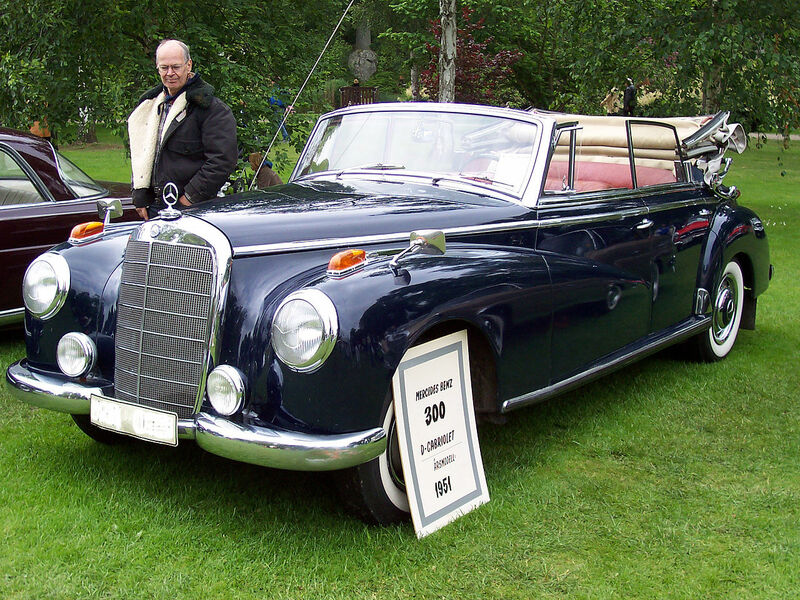 In the autumn at the Frankfurt Motor Vehicles W111 has been shown to the public. Despite the fact that the chassis was the same with pontoons, outwardly "fin" looked quite different, with elegant body, vertical block headlights, and of course, the fins themselves. In addition, Mercedes-Benz ahead of the whole world, patenting front and rear crumple zones that absorb the kinetic energy of the collision, and seat belts. Inside the cabin was more spacious, while the entire dashboard and even the steering wheel were covered with soft material. Glazing area increased by 35%, thereby improving the driver's and passengers. Comfort has also improved independent rear suspension. W111 replaced the W128 and W180 sedan, with models «220b», «220Sb» and «220SEb» (b - had apparently not been mentioned, but was introduced, not to be confused with the earlier models). The models differ in addition to the different engine capacities (from 95 to 120 liters. P.), Its layout, and «220SE» was considered a kind of flagship line. The issue continued until the summer of 1965, when there was a successor to the W108 (see. Below). However, due to its popularity «220S» models release continued, the car has received an increased diameter of the cylinder (capacity increased by 20 liters. P.) And a pneumatic, self-leveling rear axle. Because of the large volume of the engine car was renamed «230S», and its production continued until January 1968. In total 337,803 vehicles of this type were produced. Following W111 began to develop the rest of the pontoon replacement vehicles, especially two-door coupe and convertible. When designing the appearance of Mercedes-Benz tried to give the car a more sporty character with the same front and rear design of the SL "Pagoda" the future (see. Below), but only the rear part of the design has reached the coupe and convertible, due to which their "fins" lost chrome underscores. In March 1961 two-door cars besstoechnye «220SEb» furor at the Geneva Motor Show. Simultaneously with the work on the replacement of pontoon two-door 220 'on the fin were working on creating mass budget version of the fins that would replace the four-cylinder sedans W120 and W121. In the summer of 1961 it appeared W110 car in two models: «190c» and «190Dc». As before, the cars were almost identical to the W111, but had a more modest front clearance (14.5 cm shorter). W110 was more economical, especially diesel «190D», which has become a favorite vehicle for many taxi drivers. On the basis of W110-th built wagons, ambulances and so on. D. It is interesting to note that due to the same design with the W111, in a variety of upgrades for the time of release, Mercedes-Benz put the more expensive units flagship sedan on the W110, for example, backrest adjustment chairs, ventilation, exterior chrome decor, but the main thing - engines. In 1965, at the launch of a new generation of engines, "190" -e turned into "220" and "220D". But the most important was the model "230", which appeared by setting a six-cylinder engine from the W111 "230S" in body W110. In January 1968, Mercedes-Benz has stopped its production, releasing 628,282 by the time the vehicle. Next 1964 finally solved the problem with the replacement of Adenauer. As already mentioned, the car W112 «300SE», although it was equipped with an order of magnitude better than conventional fins, he still remained a massive car, and was a temporary solution to replace the W189. This successor to Adenauer, W100 limousine was almost 5.5 meters in length, have pneumatic suspension, square body and inside can be equipped with any comfort items, up to the TV. But mostly it was the engine: the old three-liter is not suited for vehicle weighing three tons, and after a series of W112 he managed to descend from exclusivity to the masses, and Mercedes-Benz has returned to his first series of V-shaped eight-cylinder engine. Motor M100 volume of 6.3 liters, with 250 liters. c., could disperse a great car to 205 km / h, making it the the second fastest German car (after the Porsche 911). Model "600" can be produced, in addition to the standard limousine, in the elongated configuration (74 cm) "Pullman" or cabrio coach "landole" who bought the heads of the countries for ceremonial purposes, as well as the Vatican as the popemobile. Overall, the car has become so successful that it continued to build up to 1981 (2,677 cars were produced).